Sherman Ruud was born on April 30, 1924, in Maddock, North Dakota. He enlisted in the U.S. Army at Grand Forks, North Dakota, on April 1, 1941, and after completing basic training and artillery school, he served with the field artillery in the United States, and then deployed to Europe, where he served in France, Belgium, Holland, and Germany, including the Battle of the Bulge. After returning to the United States, Sgt Ruud was honorably discharged from the Army on October 17, 1945, at Fort Lewis, Washington. 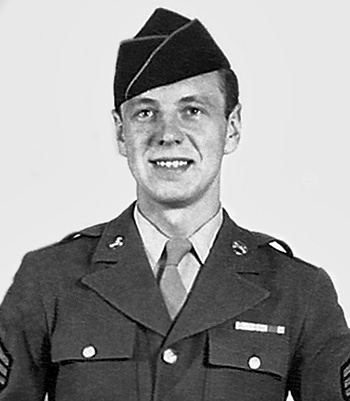 Sherman Ruud died on February 28, 1992, and was buried at Washington Memorial Park in SeaTac, Washington. And go where duty calls. Each time a good friend falls. Who bravely stay the course. In air, on sea and shore. It is their noble chore.